Hi guys! I am excited to be apart of Haul Out the Holly for the second year! Ready to make some of your own? approx. 2 inch styrofoam eggs, package says they are 1-13/16' by 2-7/16"
*After buying a spool of cording for $1.99 and it only being enough for about 3 lights I did some research and found out that for the same price I could get 27 yards if I bought metallic cording for plastic canvas. So bypass the ribbon department and head over to the plastic canvas section. Not only is there gold and silver but tons of other great colors too. Then on one end of the marshmallow press in and around making that end concave. Doing this will help it sit flush on top of the egg. Now it's time to get your glue guns out. If you have a dual temp glue gun opt for the low temp setting because the high setting tends to melt the styrofoam. Now put a generous amount of glue on the concave part of your marshmallow and place it on the center of the wide end of your egg. Next is the hard part....picking the color sequins you want. :) I bought my sequins at hobby lobby and also from this shop on Etsy. 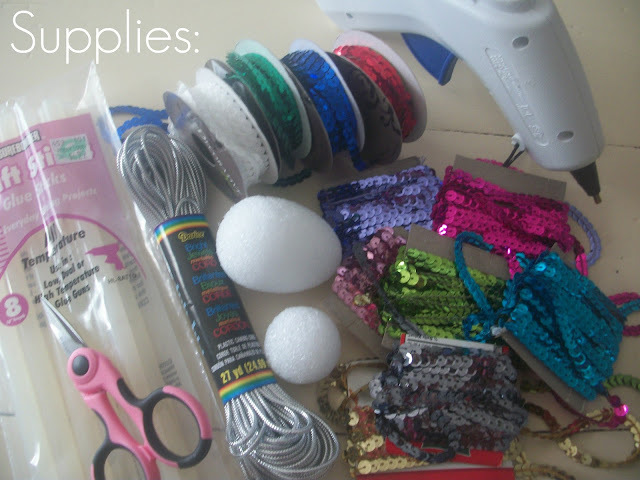 Once you have picked the color you want start with a line of glue where your egg and marshmallow meet and start wrapping the sequins around, glueing and wrapping little by little until you get all the way to the tip. Cut off the excess. Make sure you overlap your sequins as you go around so that none of the styrofoam shows through. Now for the top. I chose to do mine in silver but gold would be very pretty too. And if you don't like metallics you could always use hemp twine or jute. Poke a hole in the center of the top of your marshmallow. I use the tip of my glue gun. Make a loop at the end of your cord and push it into the hole you just made. I use the tip of my glue gun to do this too. And as I am pushing it in I squeeze out a little glue too. Start glueing and wrapping the cord around and then down. Continue until you cover all of the marshmallow. Thanks so much for stopping by and thanks Gwen for hosting such a fun party! Make sure you check out all the other bloggers and their festive tutorials! I betcha these would add a whole dimension of sparkle on a tree. Very cool! I totally want the blinged out necklace... it would be the hit of any Christmas party! These are too stinkin' cute Andi!!!!! I love them...I need to get me a glue gun! I am seriously in love with this project! Thanks so much for sharing! these are too cute- and thanks for the tip for saving money! Oh Andi! These are GORGEOUS! I am dying at your last photo...why aren't we neighbors? Andi, these are absolutely adorable and the construction is so clever. A very fun project. I do hope this holiday brings you joy and happiness. I have not seen these before and I love them! Especially the necklace! Fantastic idea! You should share it with your local Girl Scouts! These are so fun! Found you at Gwenny Penny...new follower. These are fantastic. One of the best Xmas ideas I've seen in a very long time. Thanks for sharing. Gorgeously gorgeous! I'm in love, I'm in love and I don't care who knows it!